The allegation that "bravado" led Shoreham Airshow pilot Andrew Hill to commit to a doomed manoeuvre "does not make sense", a court heard. Karim Khalil QC, defending, dismissed claims that "hubris" led Mr Hill to believe he could complete the loop despite being too low. 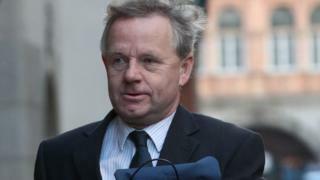 He told the Old Bailey Mr Hill's actions during the flight on 22 August 2015 were "frankly inconceivable" unless he was "impaired". Mr Hill, 54, denies manslaughter. The ex-RAF pilot crashed a Hawker Hunter jet on to the A27 in Sussex, killing 11 men. In his closing speech, Mr Khalil told the jury: "Proving the case requires you to be sure that Andrew Hill acted grossly negligently. That his conscious or deliberate actions were so exceptionally bad that he showed an indifference to an obvious and serious risk for the lives of people on the ground. "You know what we say about that. We submit that this is so far removed from everything that he has done in his entire aeronautical career." He said it was "frankly inconceivable that he would behave in such a way... unless he was suffering from some form of impairment". The prosecution allege Mr Hill committed to a manoeuvre despite flying too low and too slow. The jury were earlier shown footage of Mr Hill in the cockpit during the flight. Mr Khalil said: "He sits back? At the time when the prosecution say this man looked at the altimeter, realised he was super low and had the hubris or the bravado to say to himself, 'I can get out of this. I will just pull through'. "So he just chills back in the chair? It really does not make sense." Prosecutor Tom Kark QC earlier told jurors "there is not a single piece of research that low-level G-forces lead to cognitive impairment". He said Mr Hill chose to ignore his instruments and continue the loop. Mr Hill, of Sandon in Hertfordshire, denies 11 counts of manslaughter by gross negligence.